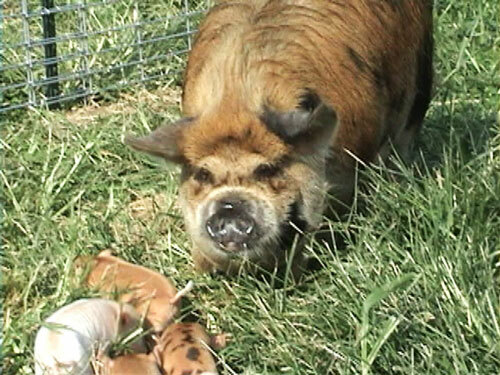 The Kune Kune is a naturally small pig with an amazingly gentle, calm temperament. They have great character, a cheery outlook on life. These pigs look like a Walt Disney cartoon version of a pig with a teddy bear face. They are between twenty four and thirty inches high, and one hundred and twenty to two hundred pounds in weight. They are completely covered in hair which can be anything between short and straight, and long and curly. They come in a range of cream, ginger, brown, black and spotted. They have a short upturned snout, and either prick or flopped ears. They have short legs and a short round body. The most unusual feature of most Kunekune pigs is a pair of tassels, called piri piri, or wattles, under their chin (like a goat). This is not unique to the Kunes but it is unusual. Temperament wise, they are delightful, being placid and very friendly. They thrive on human company. Kunes can be kept in a low fence, (ours do not test fences) come running when called, love people. If you sit down they will be in your lap. They will follow you everywhere, even into your house if you let them. They will flop on their side for a belly rub and they love to be groomed, have their back scratched,etc. But please remember, Kunes are not just a pet pig! Smallholders keep Kune Kune as meat pigs as they produce excellent sausage and pork chops along with select cuts of pork - this at a very low cost because they fatten on grass. Also, they are the perfect size for a family freezer. In New Zealand they were bred for hundreds of years for meat production but also lived alongside a family so it is easy to see why they are such an excellent all round pig! While we doubt we could ever eat one of ours, it is well known that they are the best tasting pork in the world. Kune pork is fast becoming the favorite pork of famous chefs in New York's best restaurants. Those who have tried it say Kune pork is absolutely fantastic and best pork they ever ate.